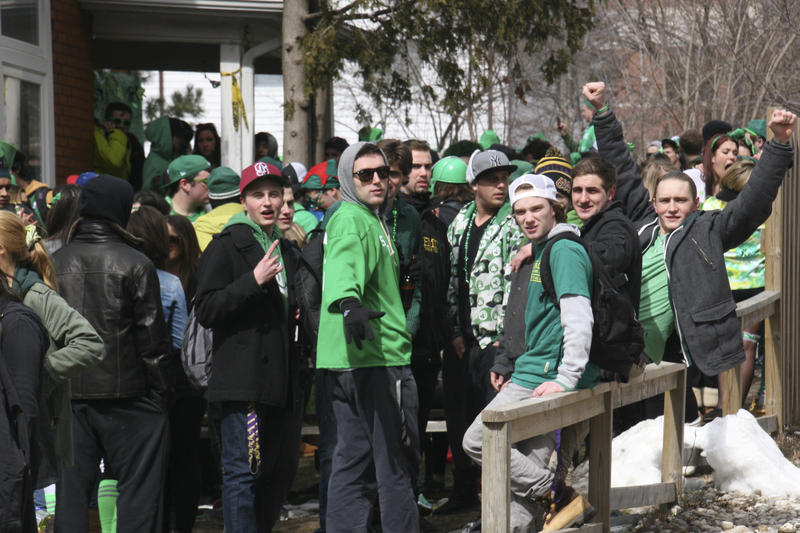 A month and half after approximately 7,000 people flooded Ezra Ave. for St. Patrick’s Day, the Waterloo Regional Police Service (WRPS) is sending a strong warning to their board — the event needs to be controlled or disaster may occur. To the WRPS, the St. Paddy’s day bash, which included a lot of drinking, partying and extremely dense crowds, could have easily turned into a “riot.” According to the report, the event caused over $50,000 worth of damages. Charges of assault, trespassing, mischief, theft and breaking and entering, as well as drinking violations, were laid on March 17. The report also claimed that there was a 25 per cent increase in the number of people on Ezra this year compared to last year. Although the majority of the people on Ezra that day were mainly students from Wilfrid Laurier University and the University of Waterloo, 30 to 40 per cent of attendees, the report added, weren’t from the Waterloo community. The WRPS, however, still maintain that the event was relatively safe. If a situation was to occur — the “spark” as Dietrich called it — then the number of police officers on scene, though many, would have difficulty managing a crowd that big. “If you have that one spark, the amount of officers … is totally insignificant to manage a crowd that size,” continued Dietrich, noting that the riots in London, Ont. last year is still in the memory of many police services in cities with post-secondary institutions. While no one was seriously injured, Olaf Heinzel, pubic affairs coordinator for the WRPS, noted that the density on the street would have made it very difficult for emergency services to get to someone who was. No plans or precautionary measures for next year’s St. Paddy’s events have been determined by the WRPS. Dietrich and Heinzel both asserted that students and the universities are going to be involved in that discussion. “We’re looking to the students for some solutions as well, we don’t want to impact negatively on their desire to get together and have some fun,” said Heinzel. Adam Lawrence, who was the acting dean of students at Laurier for the past year, noted that the university is discussing with WRPS and the city to come up with ways to keep the event under control. Discussions will take place within town and gown committees to come up with different approaches to handle future events at such a scale in Waterloo. “It’s something that we need to look at collectively,” said Dietrich.